1. I need expanses of uninterrupted, unscheduled, alone time. I have a hard time creating when there is a meeting scheduled later in the day or if I have to be present in other areas of the business. It’s hard to switch gears. So, in advance I plan dedicated studio days, where I can be alone and give myself the head space needed to create without pressure. 2. I give myself more grace and trust the process. When I read Big Magic by Elizabeth Gilbert she mentions the concept of “creative cycles.” She depicts her individual struggle with creating something, hating it, then coming back and liking it again. I almost wanted to cheer when I read it and thought “YES! I do that too!” I’ve come to know myself better and give more grace when I’m being too much in my own head. I realize that the creative doubts and struggles will always be there. I can’t will them away, but what I can do is push forward and trust the process. As idyllic as it sometimes sounds to have a career in art, it’s painstaking and frustrating. You can feel as though your worth is attached to your work and it’s hard to be discerning. I’ve learned to constantly give myself grace and pay attention to my own creative cycles. 3. I continue to learn. I love learning from other creatives. This keeps me out of my comfort zone and primes me to be inspired. Even if what I’m learning isn’t directly attached to art or design, I love trying something new and having new experiences. A few years ago, I took an improv class and it was a great lesson in being in the moment and letting go of fear. These experiences and lessons all contribute to who I am as an artist and business owner. Talk to us about your design journey and honing in on workflows, skills, and style, Amy: I’ve learned that I truly need a good 8 hours to zone in and flush out a full design. If you have a lot of design work to do, take time to research the look and style and then pick another day to spend all day and do the design. Take the night off and get back up with fresh eyes and look it over. I try not to make final designs all in 1 day about a design. My eyes need time away from it and I need fresh perspective on it. Talk to us about your design journey and honing in on workflows, skills, and style, Caroline: I feel like my design process is always evolving. I used to just sit down and whatever came out in Illustrator was what I worked on. Now I’ve moved more to pen and paper and like to sketch things out before taking them into the computer. For collections, I’ve developed this system where I set up checklists and boards in Trello. I keep a master spreadsheet of my product ideas with production notes and where I’m in the process attached to the Trello board. I use this as a brain dump and it helps me keep my ideas straight and to know how much work I need to do to reach a collection release deadline. From there, I will sketch, scan and design all I need to. I’ve found this is the best way to keep my scatter brained self in check. Talk to us about your design journey and honing in on workflows, skills, and style, Jackie: As I mentioned before, I think my journey started by throwing spaghetti at the wall and seeing what stuck the most. Professional? Maybe not. True for most of us? Heck yes! Once I realized that I wanted my designs to be perfect as far as the technical side of typography (kerning, leading, tracking etc. ), I spent a lot of time researching those topics and practicing, practicing, practicing. When I felt I had my style and skills ready, I invested in and launched a line of designs that spoke to both me and my ideal clients. That’s when Sincerely, Jackie truly took off and went from a hobby to a business. 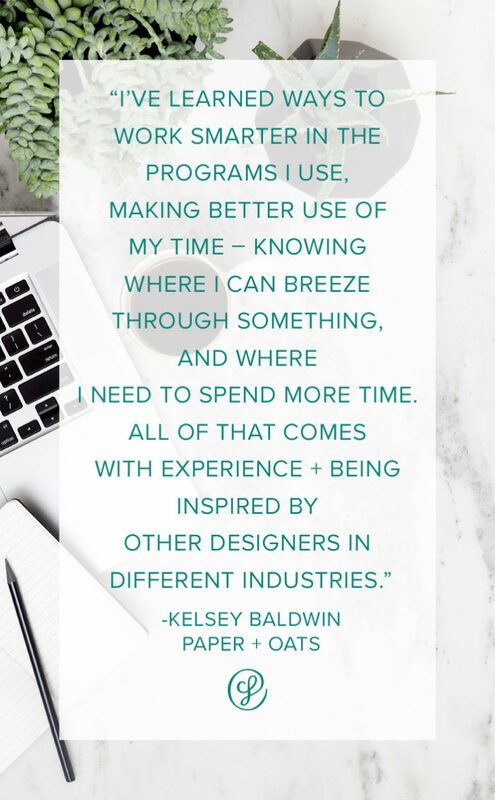 Talk to us about your design journey and honing in on workflows, skills, and style, Kelsey: I went to school for graphic design, worked for 5 years at a design agency, and have done freelance design work for 10 years (overlapping with the agency time) – and my style, skills, and workflow has definitely evolved over time! Of course I’ve become more efficient in the Adobe design programs, so I can work much faster than I used to. My style has evolved a lot – become more minimal, gender-neutral, and clean. And I’ve learned ways to work smarter in the programs I use, making better use of my time – knowing where I can breeze through something, and where I need to spend more time. All of that comes with experience + being inspired by other designers in different industries. Talk to us about your design journey and honing in on workflows, skills, and style, Paula: My graphic design journey began long before I even knew what graphic design was. I’d always loved arts and crafts and making things, though I was never good at drawing more than doodles, and I LOVED stationery. I joined the yearbook committee in high school after being repeatedly excluded in junior high from joining. Ugh. Junior high. Anyway, it was then that I really fell in love with page layout (I know, I’m a nerd!). I had a vision to create a book that was planned out and not a hodgepodge of pictures, a book that the students could really look at and feel like it represented them. I also joined the Business Professionals of America team at my school and went into competition creating letterheads, business cards, and luggage tags all the way to state without much practice or training. These two high school experiences pushed me to Texas State University where I enrolled in the Communication Design program where I lucked into some of the most amazing professors and design students whom I still admire to this day. We had a tight-knit, hard working community, eager to learn, who put out a lot of great design. Out of college, I struggled to find a job I wanted until I found one working for a home decor company designing packaging for picture frames and designs for photo albums. After my son was born, I started dabbling more in designing cute things for him like birthday party invitations and party decor. I got more and more people asking me to do custom work for them which is when I started experimenting with the idea of starting my own business. I’d learned so much from my years at the frame company not just about design, but about business and retail too that I felt like I had at least some background knowledge to forge ahead. So here I am, six years later continuing to move forward in my business and to create products that I love so that I can share them with the world. I love getting to design things that I find fun, and come up with products that are things I would like to have that I can’t find in the market. It’s especially great when other people decide they would like to have those things too! Thanks so much for sharing about your design journeys! Next month, we'll talk about productivity and holding yourself accountable. We can't wait to hear what they have to say! In the meantime, keep up with all of our creative founders through the links above.